e-foods supplies fresh produce, meat and dairy to Shearings Hotels. e-foods was able to offer a significant ongoing saving across each of the supplied product categories. The Shearings Group is one of the foremost UK holiday companies and provides 1 million passenger holidays per year. 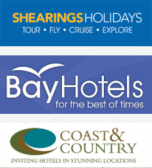 As one of the UK's prominent hotel operators, Shearings own and operate 49 hotels that are known under their two main brands; Bay Hotels and Coast and Country Hotels. The group has industry leading occupancy rates that are as high as 90%. e-foods' distinctive purchasing support includes e-live, e-foods' online system that allows sites to place one order with many suppliers, saving time and reducing administration costs. Shearings has already benefitted from e-foods' systems that consolidates invoicing and will now process around 20,000 fewer invoices a year. Although operating nationally, Shearings places a strong emphasis on using local supply routes to ensure that local, seasonal, high quality produce is being used in its kitchens. e-foods manages and has provided a fully accredited local supply chain that not only supports the local economy but is also reliable, robust and flexible. Using one single supply route for all products means that if something goes wrong the whole delivery can be affected and, with such high occupancy rates, failure to supply can be devastating. With e-foods' supply chain there is always a backup, reducing the risk and providing supply assurance. Bryan Pitman, Shearings' Group Purchasing Manager said “We are now processing 20,000 fewer invoices a year across all of our 49 sites due to one consolidated payment to e-foods, which pays to all of our local suppliers. The reduction in administration and the savings in ordering, invoicing and delivery systems strongly influenced our decision to work with e-foods. Their partnerships with local suppliers has allowed us to put in place national coverage, that supports the local economy, plus ensuring a quality service is maintained and, where needed a same day back up provided. All in all everyone benefits, Shearings, the supplier and ultimately our guests. - Coast & Country Hotels & Bay Hotels.